Studio Line: Paramount Home Entertainment - Join the race! An all-star comedy cast brings laughs from start to finish when a casino tycoon gives six money crazed contestants the chance to win $2 million in a race from Las Vegas to New Mexico. Who will win this dash for the cash is anybody's guess, but one thing is for sure -- it's going to be a hilarious ride. Box Office: Budget: $48 million. Opening Weekend: $11.662 million (2550 screens). Domestic Gross: $56.607 million. DVD: Widescreen 2.35:1/16x9; audio English Dolby Digital 5.1 & Dolby Surround 2.0, French Dolby Surround 2.0; subtitles English; closed-captioned; single sided - dual layered; 15 chapters; rated PG-13; 112 min. ; $29.98; street date 1/29/02. Supplements: “Making Rat Race”; Deleted Scenes; Gag Reel; Exclusive Interview With Director Jerry Zucker and Writer Andy Breckman; Jerry and Andy Call the Actors; The Giggles; Theatrical Trailer. While I’m not sure anyone clamored for a new film to pick up the mantle of older comedy ensemble pieces like 1963’s It’s a Mad, Mad, Mad, Mad World, it happened anyway. In 2001, we got a 21st century updating of that movie’s wild chase theme through Rat Race, the latest yuk-fest directed by Jerry Zucker. On his own with pictures like Ghost or alongside partners with efforts such as Airplane!, Zucker’s created some successful movies over the years. He does so very infrequently, however; between 1990’s Ghost and 2001’s Rat Race, he directed only one flick, 1995’s First Knight. Would Rat Race return Zucker to the winner’s circle? Not really, though the movie wasn’t a total flop. It took in $56 million, which is rather low by modern standards, but I suppose the total was decent for this kind of flick. Did Rat Race deserve to bring Zucker back to prominence? That’s a more debatable question. For the most part, I never much cared for the material on which Zucker worked. From Airplane! to The Naked Gun to Top Secret, his brand of extremely broad humor failed to inspire much excitement from me. The sole exception came from 1986’s brilliant Ruthless People, a comedy so strong that it seems almost impossible it was made by the same crew as the others. While Rat Race featured some more of the usual wide-ranging slapstick seen in those flicks I didn’t like, I thought it had its moments. Most of these occurred due to the very able cast. Race lacked “A”-list names, but its roster included a lot of talented people, and they often were able to succeed with some rather spotty material. In Rat Race, a Las Vegas gambling tycoon named Donald Sinclair (John Cleese) runs a contest for the pleasure of his casino’s highest high-rollers. Six randomly chosen people are given the opportunity to win $2 million. Each gets the key to a railroad station locker 563 miles away in Silver City, New Mexico; the first one to make it there keeps the loot. Sounds simple, of course, but events will quickly conspire to make things more difficult. The Cody brothers - Duane (Seth Green) and Blaine (Vince Vieluf) - are the sleaziest of the bunch, so when they can’t get a plane ticket to New Mexico, they sabotage the airport’s radar tower so no one can make the flight. -Gentle and naive narcoleptic Enrico Pollini (Rowan Atkinson) worries less about the money than the others; he just seems excited to be in the race. He hitches a ride with a medical courier named Zack (Wayne Knight) who has to transport a human heart to Texas for transplantation. Shenanigans ensue. Of course, shenanigans ensue for all of these parties, and Rat Race takes the point of view that there’s no such thing as a limit to outrageousness. The film clearly doesn’t reside in the world of reality, but it’s not supposed to, so I can’t fault it for that. It’s an extreme comic farce that throws gags at the wall and sees that sticks. Usually I don’t much care for this style of humor, and I have to admit that much of Rat Race didn’t work for me. Zucker has a nasty habit of telegraphic many of his jokes; rather than let them breathe on their own, he has to force them down our throats and make sure we don’t miss a second of anything that theoretically might seem amusing. To refer to Rat Race as a broad comedy would be a gross underestimation. It’s not above poo-poo humor at times, but it usually doesn’t devolve to the levels of Farrelly-esque nastiness. However, it does emphasize a lot of lowest-common-denominator laughs. I mean, this is a movie that thinks it’s clever to name Sinclair’s legal-minded assistant Mr. Grisham (Dave Thomas), for heaven’s sake! Despite the general inanity of much of the movie, I thought it seemed reasonably entertaining at times, largely due to the cast. You won’t find a true star in the bunch, but there’s still a lot of talent at work. Some of the actors were new to me; I’d never heard of Vieluf or Chapman (for good reason, as a look at IMDB indicates they’ve not done much). The rest of the cast mixes older and younger performers, but all have been around the block a few times. As such, they’re able to milk even some of the dumber situations for laughs. The whole Lucy bus escapade gets darned old after a while, but the scenes maintain humor due to Gooding’s reactions; the look of anger, disgust and frustration he shows while he endures they constant idiocy is priceless. I also really like the segments with the high rollers, as their constant obsession with gambling offers the movie’s most consistently amusing elements. Race doesn’t feature a cast for the ages, but most of them do quite well with the material. I guess every generation needs its long-distance competition comedy. We had Mad, Mad, Mad, Mad in the Sixties and Cannonball Run in the Eighties. (Hmm… I vaguely recall a Michael Sarrazin laughfest called The Gumball Rally in the Seventies as well, though the memories are too faint for me to know how well it fits in with the theme.) Rat Race is the 21st century take on the theme, and while it isn’t much of a flick, it seems acceptably entertaining for the most part. It tosses out so many gags that at least a few of them stick. And hey, how often do you find three Oscar-winning actors in the same flick? Rat Race appears in an aspect ratio of approximately 2.35:1 on this single-sided, dual-layered DVD; the image has been enhanced for 16X9 televisions. As one might expect of such a recent film, the picture looked quite solid, with virtually no concerns on display. Sharpness appeared consistently strong. At all times the movie remained crisp and well defined, and I detected no concerns related to softness. The image lacked any signs of moiré effects, jagged edges or edge enhancement, and print flaws seemed similarly absent. I witnessed no examples of grit, grain, speckles, or other marks that might mar the presentation; it was a clean and fresh picture. Rat Race boasted a nicely vivid palette; a broad comedy needs broad colors, and this flick delivered on that promise. The hues always seemed natural and lively, and they looked bold and brilliant throughout the film. Black levels came across as deep and rich, while shadow detail was clear and appropriately opaque. The image of Rat Race lacked that certain spark to make it one of the greats, but it still provided a very strong visual experience nonetheless. Also quite good was the Dolby Digital 5.1 soundtrack of Rat Race. Comedies usually concentrate on the forward spectrum, and Race was no exception. Much of the audio stayed focused in the front, where it offered good presence. Music showed nice stereo imaging and definition, while effects seemed spread across the forward channels well. They demonstrated good delineation and blended together neatly. As for the surrounds, they largely stayed with general reinforcement of the effects and music, but they kicked to life more actively at times. For example, the helicopter scenes offered solid use of the rears, and the airport scenes also created a positive atmosphere in that regard. Audio quality appeared consistently fine. Dialogue always came across as natural and distinct, and the speech showed no signs of edginess or problems related to intelligibility. Music was clear and vivid, with concise highs and reasonably warm lows. Effects also showed good clarity and range, as they sounded accurate and lively. Some elements demonstrated nice bass thump; for example, the helicopter offered solid depth and impact. Overall, the track lacked the ambition to enter “A”-territory, but Rat Race worked well enough to earn a “B+”. We start with Making Rat Race, a 22-minute and 25-second documentary. It mixes lots of film clips with shots from the set and interview snippets; we heard from director Jerry Zucker, writer Andy Breckman, and actors John Cleese, Cuba Gooding, Jon Lovitz, Rowan Atkinson, Seth Green, Breckin Meyer, Whoopi Goldberg, Vince Vieluf, Lanei Chapman, Wayne Knight, Amy Smart, Dean Cain, and Charlotte Zucker. On the positive side, we see some fun bits taken from the set, and it offers a little material about some of the various challenges. However, overall this is essentially just a very long trailer. “Making” tells us how funny the movie is and how great everyone is and how much fun it was. There’s a little decent information along the way, but the show’s still a pretty puffy and promotional experience. In the Deleted Scenes area, we find six different excised segments. Each one starts with a quick introduction from director Zucker. The segments last between 34 seconds and three minutes, 23 seconds for a total of about eight and a half minutes of footage. Zucker clearly communicates why the clips didn’t make the final cut and even offers some history in that regard, such as the ones that flopped with test audiences. As for the scenes themselves, some are good, some stink, but all are worth a look in this fun addition. The Gag Reel offers three minutes and 45 seconds of the usual flubs and goofiness. It includes some good bits that revolve around Lovitz; he cops an attitude when Vieluf hits Lovitz’ mark by accident, and the cast get their comic revenge. However, overall it’s a pretty standard affair. Similar material shows up in The Giggles. The five minute and eight second clip starts with an introduction from Zucker and then shows on long, snicker-filled take of a scene toward the end of the movie. A Conversation With Director Jerry Zucker and Writer Andy Breckman plops the two of them together for an eight-minute and 15-second interview. They offer some good information about some of the casting and changes made to the script. It includes too many film clips; these seem unnecessary and they simply pad the length. Still, it’s the most informative video feature on the DVD, as it includes more useful material than we saw in the “Making Rat Race” documentary. In addition to the film’s theatrical trailer - presented non-anamorphic 1.85:1 with 2.0 sound - we get Jerry and Andy Call the Actors. This audio-only feature offers exactly what it states: director Zucker and writer Breckman phone 13 of the performers. They ring Vince Vieluf, Cuba Gooding, John Cleese, Seth Green, Jon Lovitz, Lanei Chapman, Breckin Meyer, Whoopi Goldberg, Amy Smart, Wayne Knight, Paul Rodriguez, Charlotte Zucker, and Rowan Atkinson. Apparently Zucker and Breckman started to record a traditional commentary but got bored and decided to call the actors instead. As such, we find this 102-minute and 15-second compendium instead. Note that the audio doesn’t run during the feature ala a regular commentary. Instead, it’s available as an option from the special features menu, and you’ll see a static photo screen while you listen to the calls. You can select any of the 13 individually or choose to “play all”, which will provide the chats in the order they were conducted. Like the movie itself, “Call the Actors” is hit or miss. Some of the conversations are very entertaining, and all have something going for them. However, some - like the one with Chapman - are pretty dull, while others come across as quite amusing. Lovitz’ is the best, mainly because he acts like such a jerk; he gets into a snit and actually hangs up on Breckman and Zucker at one point. Zucker and Breckman claim that all these calls were truly impromptu and the actors weren’t prepped in advance. That concept seems believable as you listen to them. We encounter the actors in various stages of daily life. Vieluf does his laundry, Gooding preps for a shower, and Meyer picks up his wedding ring. A lot of the fun stems from the unexpected nature of the event; you won’t encounter a lot of fascinating information here, but it’s still a cool and entertaining program. 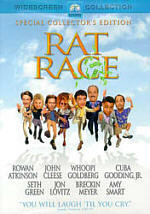 Rat Race takes an old slapstick theme and basically rechurns it for the new millennium. However, not much newness emerges, as it feels like an old-time movie recast with different folks. Overall, the movie didn’t do a lot for me, but it offered enough humor to keep me with it. The DVD provides very strong picture and sound as well as a reasonably good roster of supplements. Rat Race seems unlikely to go down as a comedy classic, but if you like your humor broad and outrageous, it might give you a kick.